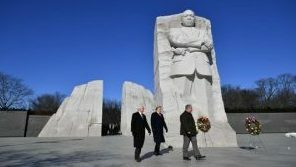 Trump is catching some flack for only staying a couple of minutes at the MLK Memorial in Washington today. To be honest, there isn’t much to see. There’s a giant statue of King, a few quotes carved into the wall, and that’s it. Not so easy to get there, either. I was quite disappointed when I visited it last year. I’m sure there’s much more about him in the new National Museum of African American History and Culture, but it’s so popular I haven’t been able to get tickets during my trips to DC. That’s not to say that a president who cared couldn’t turn such a sojourn into something more, particularly on MLK Day, but to expect Trump to do so is to set your expectations bar way too high. This was just something he was told he oughta do on a day when he had nothing else on his schedule — and keep those still-not-being-paid secret service agents on their toes. The only way to get Trump to stay longer would have been to have a table full of fast food hamburgers nearby. Particularly if they were free at last.